Calrec introduced a brand new variant on the Summa console. It offers broadcast-focused facilities presented via a straightforward and intuitive control surface. Allowing broadcasters to scale resources to their requirements, Summa is now available with 128 or 180 channels. Summa with 128 channels has been conceived as an alternative for broadcasters who do not require the larger channel count of the original Summa console. Control is via a 17-inch multitouch screen inspired by tablet-technology, which is immediately familiar, with a straightforward interface that uses established finger gestures. Summa 128 has been designed for live broadcast applications with a clear focus on ease of operation, allowing fast and easy access to controls to make it easy to create engrossing broadcast audio. On Summa 128 even complex workflow tasks such as creating mix-minus feeds are simplified. 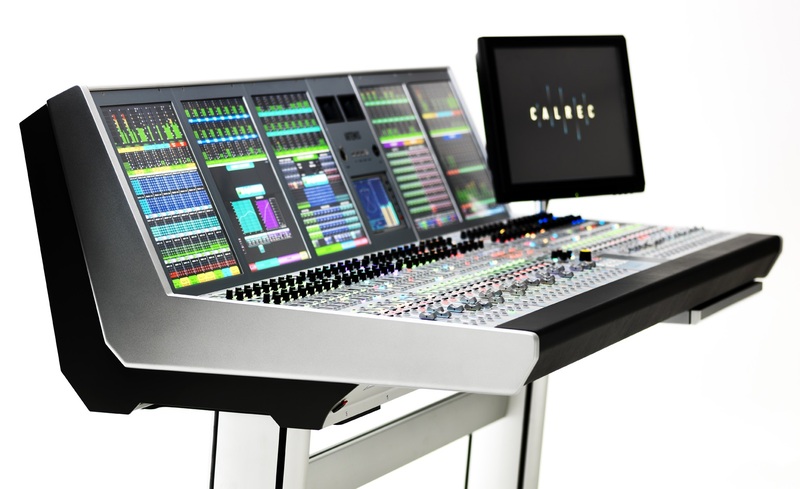 The console uses Calrec’s award-winning Bluefin2 technology at its core and the same integral Hydra2 router technology as all Bluefin2 consoles. Calrec launched a Dante interface, which works in conjunction with Hydra2 across the entire range of Calrec Bluefin2 consoles. The development gives Dante connectivity to every client on a Hydra2 network via a simple, single width 3U I/O interface card. This provides 64 audio input channels and 64 audio output channels. Connectivity is via dual-redundant RJ45 Ethernet connectors on the card’s front panel. Dante is a proprietary networking technology developed by Audinate and is currently deployed across the globe to connect many different kinds of pro-audio equipment. Calrec unveiled three new assistive apps : Soccer Assist, Ice Hockey Assist and Fader Assist. The Assist suite of iPad apps takes advantage of Calrec’s CSCP remote control protocol to simplify workflow and provide operators with new ways to interface with Calrec consoles. Soccer and Ice Hockey Assist allows operators to simplify the complex tasks of tracking audio during a game, providing an alternative approach for highly experienced operators while allowing those with less experience to create a quality mix very simply. Fader Assist allows operators to control remotely fader level, PFL, cut/on, and aux/main routing on all Calrec Bluefin2 consoles. The ability to control these fader functions remotely from any location within a Wi-Fi range provides a new level of flexibility and convenience for both mixing and set up. Cette entrée a été publiée dans Audio & Lighting Stage ☯.